Two examples from 37signals: first, Pioneer Theater. Good idea. I am stretching to call it innovation, today, maybe 5 years ago it was. Today I think any reasonably sized theater should have something like this in place. The interface is a bit confused. At first the views didn’t seem to correspond to what I would expect when I click on various seats [the broken link was removed]. Then I read a little closer and the view you see is shown where the “back wall” of the seating chart would be. Seems like it would be better to flip the seating chart around to me. The The North Face Endurus XCR Boa Trail Running Shoe has a new lacing system. 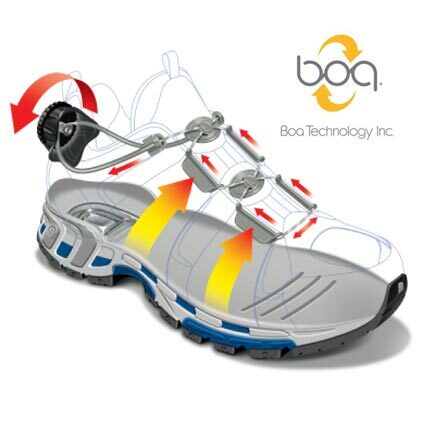 Doesn’t seem that remarkable to me, but “This unique closure automatically micro- adjusts with foot movement to eliminate pressure points, kind of like a suspension system. The resulting fit is unique and unattainable with shoelaces. Plus the mechanical system never loosens or changes.” It seems reasonable that is important to their customers and something that required a new lacing system. This entry was posted in Customer focus, Innovation, IT, Management and tagged Innovation on January 11, 2007 by John Hunter.